The Royal Crown Derby Porcelain Company, the Derby artists, porcelain products and makers marks. 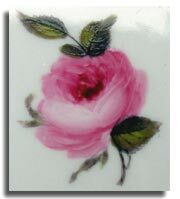 The Royal Crown Derby porcelain company is a privately owned limited company. It employs about 300 people and manufactures the highest quality english fine bone china in its factory on its four and a half acre site on osmaston road, in derby, england. Opened sometime before 1750, with the exact date of the company’s founding not known. The story begins with an entrepreneur named Andrew Planche, who migrated from France to England to escape the religious suppression of the Huguenots during the early 1700s. After settling in england, planche decided to open a porcelain factory. He partnered with William Duesbury (a wealthy English merchant) and the two men began work on a factory in Derby. Derby is located on the River Derwent near Trent. Proximity to the river allowed Duesbury and Planche to easily import and export raw materials as well as export the finished product. Additionally, Derby was known for its prolific silk trade and as a haven for artists. In 1750, the doors of the Chelsea Works factory opened. The factory brought industry to the small town of Derby and helped the town prosper. As the companys figurines and dinnerware became popular throughout Europe, the Chelsea Works began attracting some of the most skilled artists of the day. Figure painting was done by Richard Askew and James Banford. Zachariah Boreman and John Brewer were hired to paint landscapes, still-lifes, and pastorals. Intricate floral patterns were designed and painted by William Billingsley and William Pegg. Under the remarkable guidance of this design team, the company established its reputation for excellence in design, quality, and craftsmanship. In 1770, William Duesbury fully acquired the famous Chelsea Works factory from his partner and he continued to work to grow his small porcelain business. In 1775, Duesbury’s hard work was rewarded by King George III. The King bestowed upon Duesbury the rare honor of being allowed to incorporate His Majesty’s crown into the Derby backstamp. 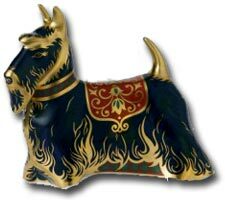 The company then became known as Crown Derby. In 1786, William Duesbury died and the company was passed to his son, William Duesbury II. as he was educated and raised close to the porcelain business, William made an excellent leader. He set to work developing a number of new glazes and body types. Unfortunately, William Duesbury II died in 1797 at the young age of 34. The company was then passed to Michael Kean, and the reputation of the Derby company began to decline and many important artists left the Derby factory in search of other opportunities. 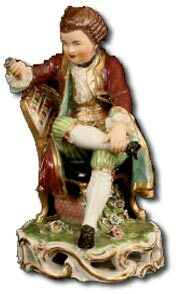 In 1811, to prevent any further loss of reputation, leadership of derby porcelain was passed to William Bloor. Bloor had a reputation as a shrewd businessman. He was recognized as an art lover with an appreciation for works that were richly coloured and elegantly styled and under his leadership the company began designing brightly coloured Japanese imari patterns. The new lines featured intricate geometric patterns layered with various floral designs and new artists were hired as the company restored its former glory. In 1877, the old Derby factory was torn down and a new one erected. The opening of the impressive Osmaston Road factory would be the beginning of the modern period of Derby porcelain and crown derbys patterns became immensely popular during the Victorian era. Victorians relished the romantic and lavish designs that were produced by the Derby factory. In 1890, By order of a Royal Warrant, Queen Victoria appointed Crown Derby as “Manufacturers of Porcelain to Her Majesty.” and the company became known as Royal Crown Derby. Today, Royal Crown Derby is owned by S. Pearson and Son and is part of the Allied English Potteries Group. 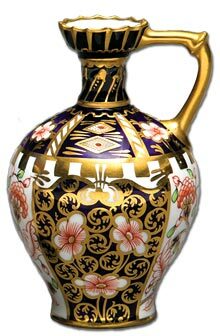 In 1981, the company introduced a line of paperweights which have become immensely popular and Royal Crown Derby still continues to produce patterns in the imari style. Derby figures can be identified by three unglazed patches on the base, and earlier glazed figures often have a dry edge. Early examples were some of the finest ever modelled in Britain. In the 1770s Derby pioneered the use of unglazed biscuit models in Britain. William Duesbury, initially an outside decorator for the factory, took over as director in 1756, producing pieces in quite open imitation of meissen porcelain. Characteristic Derby ware of the period includes ink sets, potpourri vases and salts decorated with landscape scenes set with tiny figures. Duesbury acquired the chelsea porcelain factory in 1770 – and products were known as Chelsea-Derby until the factory’s closure in 1784 – and Bow in 1775. The product range broadened dramatically, and a stronger china body incorporating bone ash was introduced. 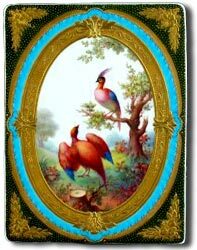 Sevres porcelain took over from meissen as the main source of inspiration, with neoclassical decoration and rich ground colours of claret and turquoise. In the 1770s, the Japan patterns inspired by imari porcelain were introduced and became strongly identified with Derby for the next two centuries. Most memorable of all is the work by artists such as Thomas Steele, Zachariah Boreman, William ‘Quaker’ pegg and William Billingsley, whose work included exquisitely painted flowers, fruit and Derbyshire landscapes. Bone china replaced soft-paste porcelain at Royal Crown Derby in the early 19thC. But from 1811 the emphasis shifted to inexpensive products, and quality declined. The factory closed in 1848. 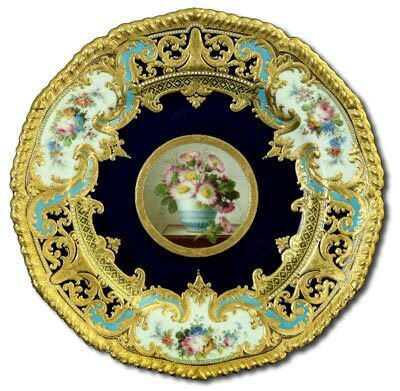 Crown Derby Porcelain Co, was set up in 1876 and produced decorated and gilded bone china.